American journalist Austin Tice disappeared in Syria in August 2012. The former Marine reported for The Washington Post, McClatchy Newspapers, the AP, CBS and others. 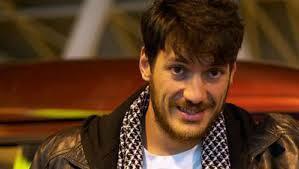 A video released in 2012 showed Austin Tice held by Islamists. Austin’s parents asked the White House for assistance finding their son. The parents of a missing journalist detained in Syria and the press freedom group Reporters Without Borders are calling on the White House to help bring the journalist home safely. Marc and Debra Tice announced Thursday they are taking part in meetings for a White House policy review on how to handle hostage cases. Austin Tice of Houston disappeared in August 2012 while covering the civil war in Syria. Tice is a former Marine who has reported for The Washington Post, McClatchy Newspapers, The Associated Press, CBS and other outlets. Tice was one of the few journalists reporting from Damascus when he vanished. A video released weeks after his capture has been the only sign of him since. Unlike American journalists James Foley and Stephen Sotloff, who were beheaded last year by the Islamic State of Iraq and Syria (ISIS), Tice is not believed to be held by the militant group. Austin Tice has been missing for two years. His parents Marc and Debra from Texas continue to search for their son. Please keep Austin and his family in your thoughts and prayers.